The long-running Need For Speed franchise has returned once again, but will the newest installment in the up-and-down racing series be the best? Reaching The World Tour: In Shift, the focus of the game is on the very in-depth career mode that has you racing a variety of vehicles on multiple tracks in countries around the globe; all while working towards the goal of being invited to the "NFS Live World Tour", the biggest racing event in the world. To get to the prestigious NFS event, you will find yourself entering a considerable amount of qualifying events to earn the "right" (stars/points in this instance) to compete and potentially win the NFS Live World Tour. Innie Minnie Miny Moe: In NFSS, you have a wide range of events to enter in your quest to earn stars/points for the NFS Live World Tour and also collect cold hard cash to upgrade your ride or purchase a new one. Race: This type of competition is your basic circuit race. You take on a dozen or so opponents and try to beat them to the finish line. Eliminator: In the elimination event you better get your tail outta last place if you want to stay in the game. Every lap that goes by the last place vehicle is eliminated for the race. Keep moving up in the pack and you will be fine, fall behind and it's game over! Drift: If you think you are a master of the drift, then you can try your hand at the drifting event. In this event it is all about technique. You will be entered into a marked course that is scored by how fast and controlled you are able to maneuver it. The driver with the most points wins the event. Driver Dual: In the driver dual course it is one-on-one action. You will be pitted against another driver and the goal is to either over take your foe or make sure he doesn't over take you. Series: Here you will enter a series of races featuring multiple tracks. You will earn various points depending on your placement in each race. The driver with the most points at then end of the series is the winner. Endurance: Do you think you are the Iron Man of console racing? Well, put it to the test with the endurance challenge. In the endurance event you are put through hour long races that are built to not only test your vehicles endurance... but also your own! Manufacturer: The manufacturer event is for all of you racers out there that feel unbeatable. Here you will have your pure racing skills tested when you are forced to take any random vehicle that is thrown your way and drive it to victory. Time Attack: Time attack events are really simple. Just set a new lap record while the current lap record holder is fighting you the entire race. Hot Lap: In the hot lap event you are given three target lap times to beat and three stars to win it. Beat each lap time to earn your stars and conquer the hot lap event! Invite Only: Dominate your local circuits and maybe you will get a "special" invite only opportunity to race some of the fastest cars against the best drivers in the sport. As you can see, these events all feature a little something different from the previous one. Starting positions, number of opponent's, time of day, choice of cars etc. can all be different depending on which event you choose to compete in. In addition to those events, there is also a Quick Race option that allows you to take a car, pick an event and track and start burning rubber. This is not in the career mode, and is instead mostly used for just a quick race (hence the name) to sharpen your skills. This Is MY Ride: A lot of what makes the career mode so expansive is the ability to customize your car to you liking in every way you could possibly think of. Visuals: We all know cool custom graphics make you go faster! Ok, so maybe the only look cool, but hey, we need some style to go along with that speed right? In NFSS you are able to re-spray your car a different color and even add different paint colors to different areas of the vehicle. If you want red mirrors, you can make it happen. Silver rear bumper? No problem. How about a yellow roof? We're not stopping at a simple paint scheme. We want some nice wheels too. There are a ton of custom rims choices in this game. We are not talking about generic wheels that have just been thrown into this game; in the wheel area of the customization you will find all of the name brand manufacturers featured in today's current wheel market. Not only can you change the rims on your car, you can also change the size of the rims! If you're a wild and crazy guy (or gal) you can even put different rim sizes/manufactures/colors on the front or back of the vehicle. This in-depth visual area can melt away the hours as you customize every aspect of your vehicle. Upgrades: You got money? If you do, the possibilities are endless for the things that you can upgrade on your ride. With the right amount of coin you can make your ride perform exactly how you want it to. Parts: Are you sick and tired of your poor performing engine? If so, change it! In the parts area of your garage you can change engines, drivetrains, add a turbo/supercharger or focus on better handling by adding new tires, brakes and improved suspension. Aerodynamics: If you're looking to get a leg up on the competition you might wanna check out the Aerodynamics area of your garage. Here you can take that stock racecar you have been cruising around in and get it ready for the big boys table. Throw on some bodykits for extra downforce and improved aerodynamics or strip out the cockpit for reduce weight. Race Parts: Wanna go fast? How about really fast? If so, why not add a nitrous tank to your racing beast? Or maybe throw on a new exhaust system or add fatter tires? In the race parts section of your garage, in no time at all you can build yourself a mighty fine racing machine. Works Conversion: If you have bought all the parts and conversions for your car then it's time to step up you r game. Works bundles cost serious coin, but go into microscopic details to squeeze every last ounce of performance out of your ride. Advanced Tuning: Maybe you don't have the necessary funds to improve your ride like you want? Well, that's OK, because you can still add your own personal touches in the advance tuning section of your garage. Here you can adjust everything from tire pressure to shocks and drivetrains until your baby purrrrrrs on the track. It may not be new, but you will have it running at his max performance while you rack up the dough for more upgrades. The career mode is, in a word... massive! You will not run out of things to do while racing and in between races your time will be spent buying, selling, and customizing your rides. Bumper Cars: In addition to the customization aspect of the career mode, the game also has a huge focus on how you drive while on the track. When competing, you will be building a "Driver Profile" at the same time. You build your Driver Profile by the way you drive. You can either be an "Aggressive" driver that will pull out all the stops to get first place, or you can opt to be a "Precision" driver who gracefully slides into the top spot on the podium. You earn aggressive points by bumping into your opponents, making them spin out and overall roughing them up during the race. Likewise, you earn precision points for your Driver Profile by overtaking your opponent's without even tapping them, as well as other things such as racing an entire lap cleanly with no roughhousing. At the end of each race your points you have earned for being aggressive and using precision are tallied up, and at the end you are deemed either an "Aggressive" driver or a "Precision" one. As you earn points, you will level up your Driver Profile as well. When you level up your profile, you will get rewards such as a lump of money from sponsors or unlock new customization options for your car. Having either title does little on the track to be honest, but it is rather interesting knowing what kind of driving style you have. I'm Blind: Moving onto the actually racing portion of the game, you will be in for quite the surprise when you get behind the wheel. Shift has completely remodeled the way you race and it is a massive, and welcomed, change from the Need For Speed of old. The default view when racing is right in the center of the action, the cockpit. You will have a view of the road from inside your vehicle and will have to think quickly while in that camera view. You can change it at anytime, but we feel the game to be much more intense and realistic if the view is left default. And that is what Shift is all about: realism in every way. When you're playing, it is easy to say this is the closest thing to actually being on a real track racing at triple-digit speeds. As soon as you begin the race, it is astonishing how realistic Shift really is. The handling of your car is amazing and gives you the sense of weight that every racing game should have. As well as that, the physics showcased in Shift are incredible. Overdo a turn and next thing you know you are sliding off the track into the dirt heading towards a wall. You can even use this to an advantage as you can bump your opponents and make them slide off the track, putting them in last place. Also, the game has a very impressive crash system that gives the game a great sense of realism. Should one of your opponent's crash on the track, their vehicle could end up being totaled and its remains will stay on the track until you finish. See one of your rivals wreck, and you could be next as you clash into their crushed body or run into stray wheels. In Shift, you can set the damage to be either "Visual" or "Full". If you opt for visual, your vehicle will take damage but it will not affect its performance and will be just that: visual. Though, even if you do choose visual as your setting, should you take a few bumps on the road your windshield will end up cracking and eventually become bad enough to seriously obscure your vision. This is a great little touch, as it just adds some more detail to the game to help you become more engrossed. If you choose to go with full, you will need to be completely mindful of your ride and what condition its in. Take a hard crash and you could be out of the race. Throughout the game, you will see more and more of these "little" touches that the Shift team did an incredible job of making. 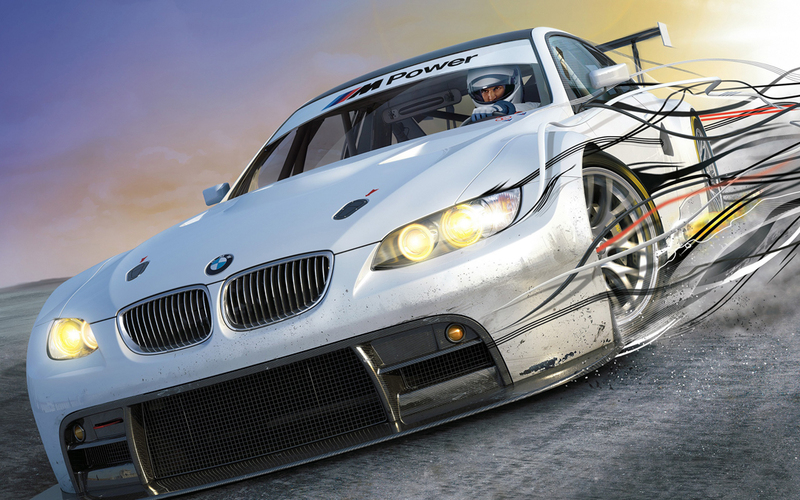 There is no question this one of the most realistic racing games on the market. Rent vs. Buy: Need For Speed: Shift is an amazing game that has vastly changed from its predecessors and is no longer that arcade-style game that we once knew. This change to be more realistic may not be for everyone, but for those who do enjoy tuning and simulation racing there is really no need to look further then Shift. The outstanding visuals, great physics and controls, unseen customization, tuning options, unbelievable realism and the simply vast career mode made for an exceptional gaming experience in most every way. As hard as we looked, we simply could not find many serious flaws in Need For Speed: Shift and this game is undoubtedly a must-buy for (simulation) racing fans.